Everything I know about nailguns I’ve learned from Quake – but you probably already guessed that. Also, I had originally planned for a fireworks-related comic for all you celebrating Americans today, but I scrapped it as it turned out too crude – yup, even more so than the above comic! Typical Murphy. Even back before the zombie apocalypse he used to steal the other guys’ sandwiches out of the breakroom fridge. Indeed, another comic! 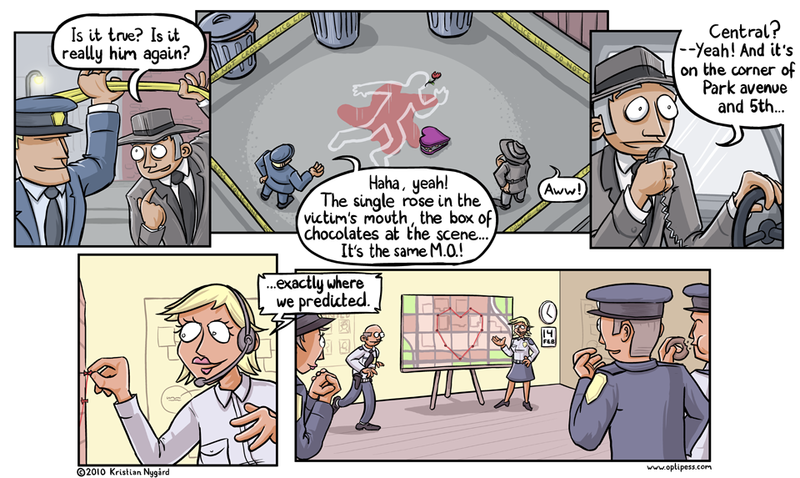 This one’s sort of a sequel/prequel to this strip from a few months ago. The next victim of the Crime Scene Killer will be murdered inside the previous crime scene(s), further adding to the confusion.